The stark ruins of Dunstanburgh Castle stand on a rocky promontory projecting into the North Sea from the Northumberland coast some ten miles south of Bamburgh Castle. Not only is Dunstanburgh a little less well known than its illustrious near neighbour, it is also considerably less easy to get to. In this day and age, when you can tumble out of your car and directly into most visitor attractions, the need to expend some effort to reach Dunstanburgh adds hugely to the experience of visiting. Not that the experience is really in need of assistance. From some angles, especially from the north, Dunstanburgh can look a little sparse: a couple of ruined buildings sticking up from the otherwise apparently featureless dome of the promontory. The reality is very different. The remains of Dunstanburgh Castle are surprisingly extensive, albeit dwarfed by the huge site they were built to defend. There is a considerable amount to see here, and a fascinating story of thwarted ambition to enjoy. Getting to Dunstanburgh Castle means walking. Most people park at the car park on the road into Craster. From here it is a 1.3 mile walk to the castle. The main advantage of taking this route is that the largest surviving parts of the castle, the southern walls and the gatehouse, are in view for much of the walk. The second route of approach is from a much more limited parking area at Dunstan Steads, which is found at the end of a minor road heading south east and then east from the village of Embleton. This walk is about 0.9 miles long (each way) and follows tracks alongside the fairways of Dunstanburgh Castle Golf Course that bring you to the steep northern slopes of the promontory, which you then skirt as you make your way around to the gatehouse. Evidence, in the form of pottery and artefacts, suggests that the promontory here was occupied as far back as the Iron Age. Meanwhile, the existence of traces of an ancient embankment outside the southern wall of the later castle have led to the suggestion that this was the site of an Iron Age promontory fort, perhaps dating back to the third century BC, which continued in use during the Roman era. Actually, if you think about it, it would seem a little odd if our distant ancestors had not made use of such an obvious defensive location. While the early history of the site is cloudy and speculative, the origins of Dunstanburgh Castle itself are very clear indeed. 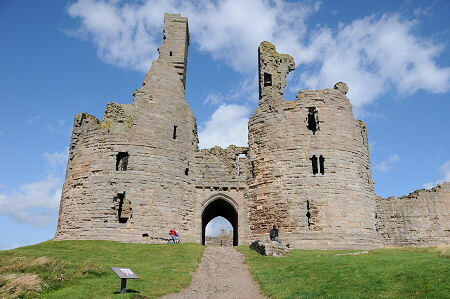 Thomas, Earl of Lancaster, inherited the Barony of Embleton in 1298, after the death of his father, Edmund. What makes this significant is that Edmund was the younger brother of King Edward I of England. Edward I died in 1307 and the crown passed to his son, Edward II, a man who must have been a great disappointment to his formidable father. The story goes that during his life, King Edward I tended to favour his more militarily accomplished nephew Thomas to his son Edward. When the older Edward died, Thomas clearly felt he would have made a better king than his cousin. Matters came to a head in 1312 when a number of English barons including Thomas, Earl of Lancaster, captured and subsequently murdered Piers Gaveston, a Gascon knight who was a favourite and very close personal friend of Edward II. The barons were subsequently pardoned by Edward II, but this incident seems to have brought home to Thomas his need to have a secure bolt hole he could retreat to when the need arose. 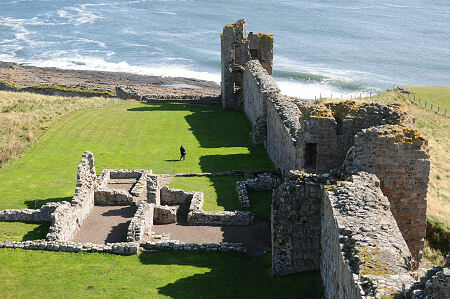 The site he chose was the promontory at Dunstanburgh, and work began in early 1313. Thomas was a man of immense power and great wealth, and he clearly decided that if he was to have a castle, then it would be the very best castle that money could buy. And by "best" we don't necessarily mean the strongest. What Thomas wanted was the ultimate status symbol: a castle intended to demonstrate just what England was missing by having Edward II as king rather than Thomas himself. The most obvious statement of this status was the great gatehouse, which still stands as the most impressive surviving part of the ruined castle. Thomas commissioned the renowned mason "Master Elias" to build his castle, and the instructions he issued were to build a gatehouse 80ft high with a tower on either side of the gateway. This was the sort of structure which had proved so impressive in some of the Welsh castles built by Edward I in the closing decades of the previous century. The main difference was that Thomas's gatehouse was to be even taller and more imposing than those built for the old king. The message this was intended to convey to Edward II could hardly have been clearer. 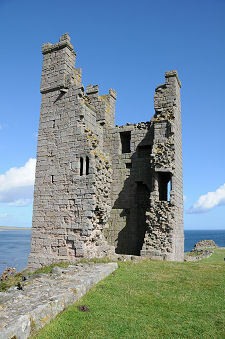 The gatehouse stood at the southernmost tip of Dunstanburgh Castle, and Thomas also commissioned the building of the southern curtain wall, the towers along it, and the Lilburn Tower, which dominates the highest point of the promontory, overlooking the northern approaches. Walls were also built along the western side of the promontory, overlooking the shore on the east side of the castle. No walls were needed on the north side of the promontory, as this was protected by the sheer Gull Crag. The area of the castle which emerged as a result was huge: 4.5 hectares or 11 acres. There is a sense in which this was simply the size that resulted from defending the lines that were most readily defended. On the other hand, perhaps Thomas believed that size really did matter. Difficult thought it is for the modern visitor to grasp, the huge defended area you can see today formed only part of the overall design of the castle. 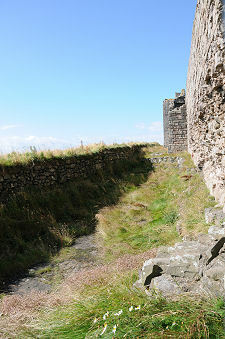 The whole promontory on which Dunstanburgh Castle stands, including the walled area you see today and another, even larger, area to the south, was turned into a virtual island by the building of three large meres or artificial lakes linked by moats and backed by large defensive earthworks. At the southern end of this, over a third of a mile south of the great gatehouse, a natural inlet was improved with a 75m long stone quay to provide a harbour to serve the castle. In August 1319, Thomas, Earl of Lancaster, probably paid his one and only visit to his newly completed castle while en route to take part in the siege of Berwick-upon-Tweed, which at the time was in Scottish hands. In March 1322 he again headed for Dunstanburgh after yet another revolt against Edward II went wrong. He never reached it, being captured and executed at Pontefract while en route. Dunstanburgh Castle passed to Thomas's younger brother, Henry. 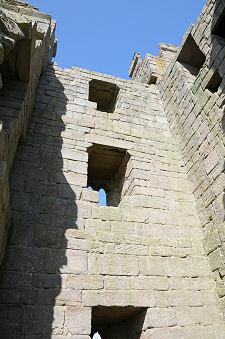 After Henry's death significant repairs were made to the castle, and a new range, the Constable's House, was added within the main curtain wall east of the gatehouse. 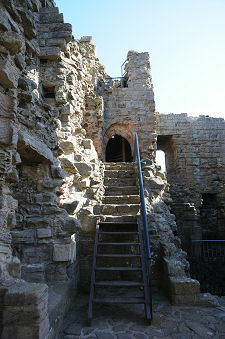 In 1362, Dunstanburgh Castle became a possession of John of Gaunt, Duke of Lancaster and younger son of King Edward III. He paid for repairs to the castle, but otherwise gave it little attention until he became Lieutenant of the Marches in 1379, a post that required a strong base in Northumberland. 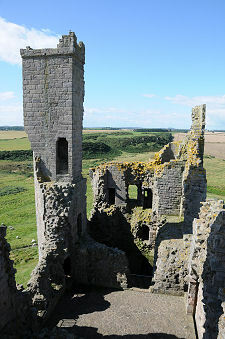 Gaunt made a series of changes to Dunstanburgh Castle intended to turn it from the theatrical backdrop created by Thomas, Earl of Lancaster, into a fortress that was truly defensible. His first change was to build a mantlet or defensive wall that separated a courtyard behind the gatehouse from the rest of the interior of the castle, which as a result became a large bailey. He then built a tower and other buildings on the line of the mantlet, which again meant that the core of the castle would be more defensible if enemies had penetrated the bailey. Perhaps his most significant change was to block up the original gateway (which has since been reopened) in the gatehouse, and turn the original gatehouse into a "donjon" or keep. A new gatehouse was created to the west, controlling access to the bailey and creating another barrier for anyone wanting to capture the castle. 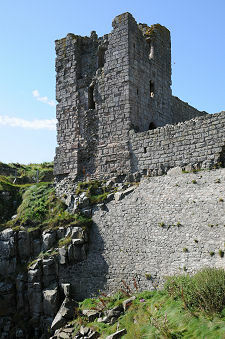 Dunstanburgh Castle needed its defences for the first time in 1461 during the Wars of the Roses, when it was held by Sir Ralph Percy for the Lancastrians against Yorkist forces. Sir Ralph subsequently surrendered the castle, though he was again under siege here in December 1462. By 1470 Dunstanburgh was such a backwater that its garrison had resorted to piracy to supplement their income, and by the early 1500s it was falling into ruin. The gatehouse was used as a residence in the 1590s, before being brought by the Grey family, who farmed the interior of the castle. The coast either side of Dunstanburgh was heavily defended during the Second World War and traces of this can still be seen. The castle itself passed into State care in the 1920s. Today it is owned by the National Trust and operated as a visitor attraction by English Heritage.